Themedy has been chugging along as we continue to add new functionality and new themes for both Thesis and Genesis frameworks. 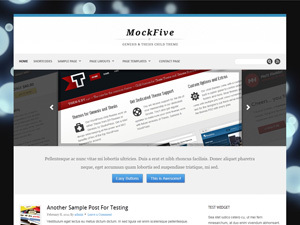 Most recently we added a portfolio / blogging theme called MockFive and also some easy to use shortcodes. This theme is our latest and greatest child theme for both Thesis and Genesis. It boasts a very comprehensive custom home page with a few different widget areas to show off your latest posts or hook a visitor in. The featured post/portfolio slider is front and center with a very interesting look- sure to impress. MockFive is our second theme to include portfolio functionality, so you can showcase your latest works with style. We use a separate post type and custom page templates to make setting up different portfolio/services/items a breeze. We’ve included 12 (yes, 12!) unique styles in the child theme to choose from. Of course, with our Themedy options panel you will never have to touch any code. All that being said, go ahead and check MockFive out in the demo area here. New to all Themedy child themes is built in shortcodes and also an easy way to add them. A shortcode is basically an easy way of adding additional content, features or styling to your WordPress pages, posts and widgets. We’ve included stuff like CSS3 buttons, info boxes, columned layouts, social media buttons, and more. Along with the actual shortcodes, we’ve also included an easy way to implement them into your pages and posts. When you have a Themedy theme active, your visual editor will now have a Themedy icon button available. You get the chance to preview and set your options before having them inserted into your editor. Find out more about Themedy shortcodes here: http://themedy.com/usermanual/#shortcodes.